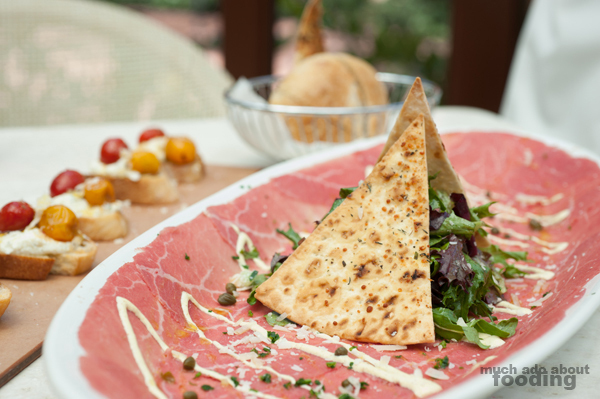 [Giveaway details at the bottom of the post] The signs that appeared at Irvine Spectrum months ago created some curiosity - what exactly is Tuscan cuisine? 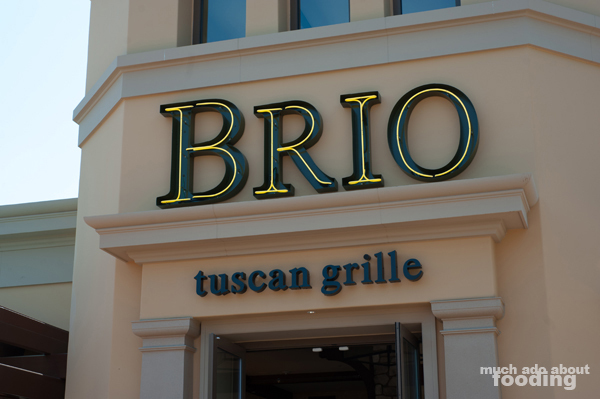 I and many others had seen the series of directional posters in the walkways of the center excitedly advertising the new opening of BRIO Tuscan Grille in the summer. It was the middle word that had people interested since there weren't other establishments in the area touting such style of food. It would be Italian but different somehow. After some delving, I realized that it was not a new restaurant by any means but rather, just new to the area being only the second Californian location of the chain. 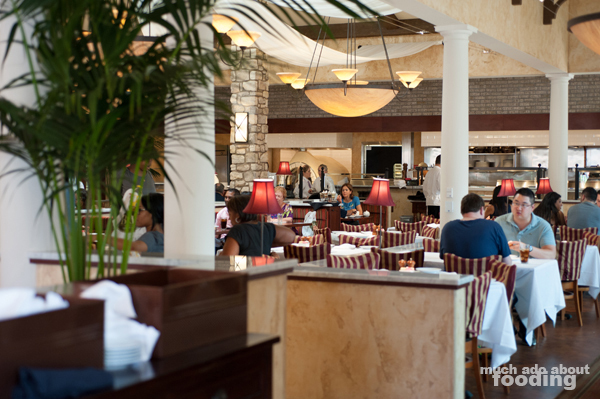 Meant to be a more upscale but casual restaurant, BRIO Tuscan Grille services to a wide range of clientele and aims to be a neighborhood restaurant. With their wide, wrapping patio, I can believe that! I came in on invitation to check them out a few weeks after opening. There were already several tables full that day for lunch! The Irvine location is headed by Executive Chef Andre Lane and led by General Manager Natalie Devitt, whom I met and has had experience with the restaurant group before as a GM of their first California location in Ranco Cucamonga. 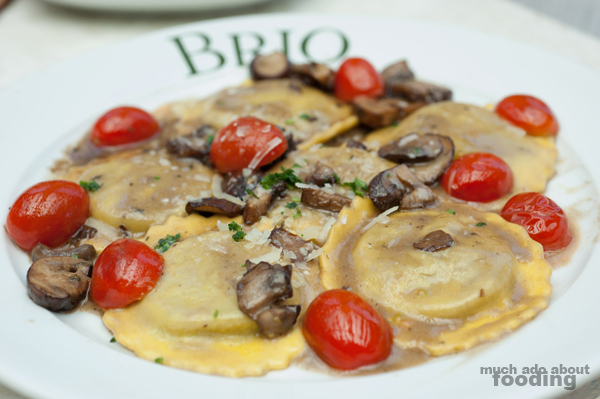 Upon entering the restaurant, I realized just how large the space was both inside and outside; they say that they have seating for 225 guests there, and in its location, I have no doubt BRIO will fill that up on some nights. The price point certainly helps here as their lunch entrees start at $10, a reasonable range for the lunch crowd, and the dinners begin at $12. Their menu also lists out the calorie count per dish for the health-conscious and includes icons next to those lighter items coming in at 595 calories or less. Want to make sure? Order off of the "The Lighter Side of Tuscany" section to guarantee yourself smaller bites that are still substantial like their Chicken Piccata, Blackened Tilapia, and 5 oz. Filet Brio. In addition to the vast space, I was also struck by the decoration inside which was very open and welcoming, making great use of natural lighting through skylights and ceiling-to-floor windows. The interior took advantage of Italian mosaic looks and plaster along with elegant but simple columns in between sections rather than a typical rectangular pillar. In keeping with trends for restaurants these days, the kitchen is also very open for all of the guests to see what the chefs are doing in exhibition fashion. It nearly had an outdoor feel for being indoors, and the furnishings reminded me more of an inviting home space than a formal establishment. The menu is quite extensive, offering just about something for everyone. We were a bit impressed with their entree salad selection as well, coming in with six options instead of the typical one or two side salads with protein options (some places just add chicken to a Caesar and call it a full lunch). To drink was a large wine selection with some fair choices, most geared towards a group setting as bottles were more available than glasses for options. There were also fruit-forward cocktails listed but I had to get myself a glass of their White Peach Palmer ($3.50 - Monin White Peach Puree, housemade lemonade, and iced tea) which seemed perfect for the sunny day. It was sweet but not overly so, and the tea was prominent which I prefer over sugary drinks. 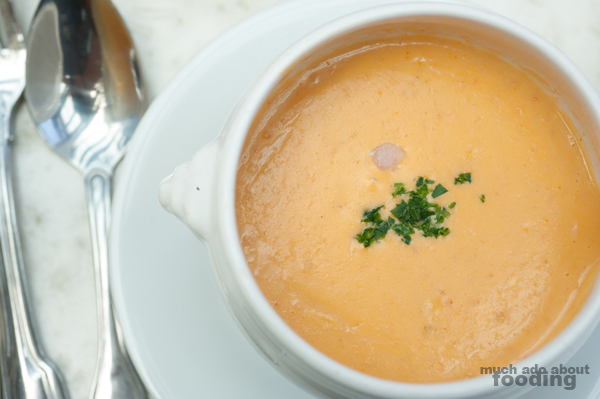 To start, we tried the Soup of the Day which was a Cream of Mushroom Soup ($4.95) and the Lobster Bisque ($6.95 at 460 calories - shrimp and touch of sherry). 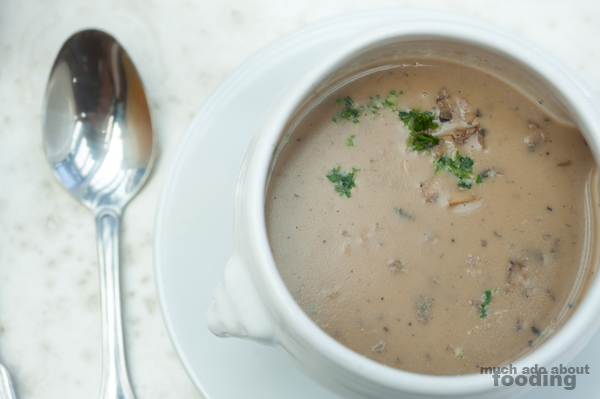 There was plenty of mushrooms in the former soup which can please the fungivore but after a while, it started to become quite salty. The bisque was a near neon orange when it arrived which led to trepidatious tastes that yielded an "that's okay" reaction. To be honest, while the texture was smooth and on point with a bisque, the flavor was a bit too salty and shrimpy for my preference. Despite the menu being quite calorie-conscious, we certainly weren't and made sure to get a taste of their appetizers for a fuller sense of the menu. 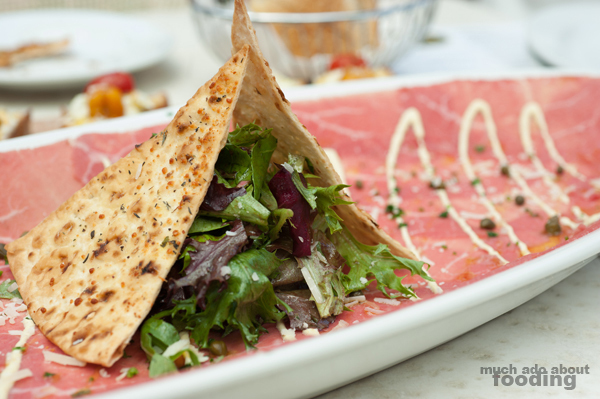 We opted for the Beef Carpaccio ($11.45 at 530 calories - with field greens, capers, mustard aioli, and Parmigiano-Reggiano) and the Roasted Tomato & Herb Pesto Bruschetta ($9.95 at 500 calories - grape tomatoes, Ricotta, Parmigiano-Reggiano, fresh thyme, and pistachio mint pesto). What I did not expect was for the carpaccio to arrive in a large boat of a platter with nearly every visible part of the whiteness covered by a paper-thin slice of tender beef. It could have been an entree of its own had the pieces not been so delicate. The mustard aioli and capers were fine touches to the beef, cutting through with their acids to partially cook the raw meat in our mouths. Between the two starters, it was our preferred. 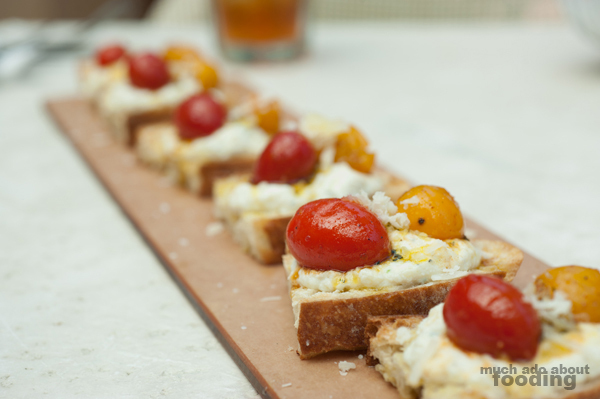 The bruschetta was slightly a letdown as the tomatoes were barely roasted if one could call it that precisely; they seemed more blistered than roasted and for the particularly plumper ones, the heat did not reach through. However, the ricotta on top was a good touch and paired well with the thin pesto on top. For my entree, I went for the "Lighter Side of Tuscany" section and ordered the Shrimp Mediterranean ($14.95 at 485 calories - spicy grilled jumbo shrimp, orzo and farro pilaf, broccoli, asparagus, tomatoes, spinach, Feta, and pesto vinaigrette) while my friend chose the Ravioli Di Bello ($12.45 at 880 calories - Portobello ravioli, crimini mushrooms, tomatoes, Parmigiano-Reggiano, fresh thyme, and champagne brown butter sauce). 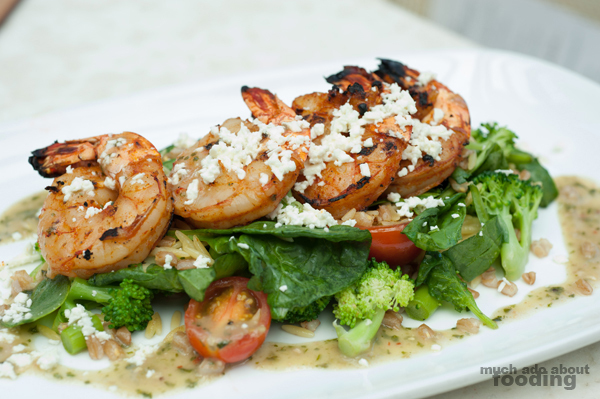 The shrimp in my dish was done extremely well being juicy and flavorful through and through. I kept raving about them as I worked my way through the dish but was slightly disappointed that the flavor did not carry through to the other parts of the plate. The orzo and farro pilaf was a nice alternative to the typical rice pilaf and had both a good salt and texture to it but the vegetables could not hold their own. Perhaps it was because the dish was meant to be lighter but I believe you can definitely achieve health without forfeiting flavor. That being said, flavor was not lost through the ravioli which was rich with mushroom goodness. The thyme really shone here too, and the sauce was spread in just the right amount of thickness to complement, not overpower. Our only note that didn't make this a perfect dish was that the pasta dough had a strange mouthfeel and fell apart in uncommon areas rather than coming away with just the bite. Despite feeling quite full, we were victims to the BRIO dessert trap; once our waiter brought out the rotating rack of "small" desserts, it was difficult to say no. 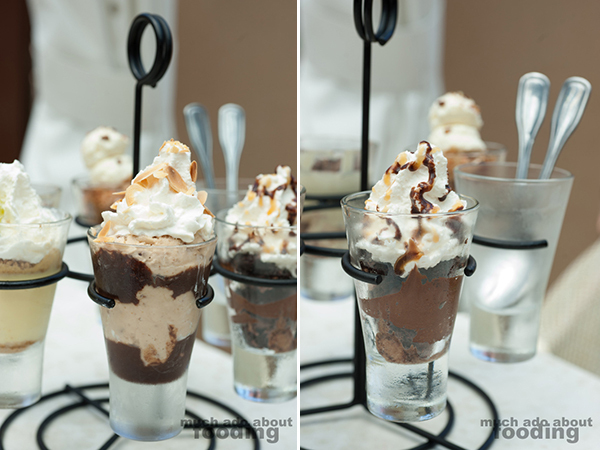 They have shotglass desserts of varying types to suit any sweets person but they also allow the indecisive to get the Dolchino Sampler ($11.95 at 300-700 calories each) which includes all of the shotglass desserts for a deal of a price: Chocolate Caramel Cake, Peanut Butter and Chocolate Mousse, Tiramisu, Key Lime Pie, and Carrot Cake which normally go for $2.99 each. 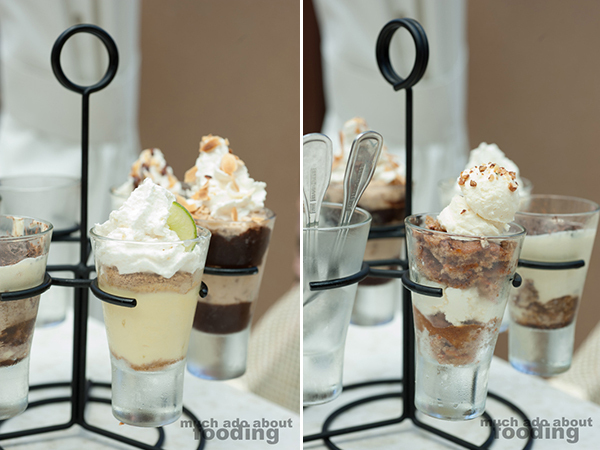 For the most part, many of these desserts relied on their cream and mousse bases but perhaps that was to prevent them from being overwhelming. I especially enjoyed the peanut butter one because it was quite rich and strong in flavor; however, everyone including the waiter agreed that the carrot cake was a powerful contender for most favorite. 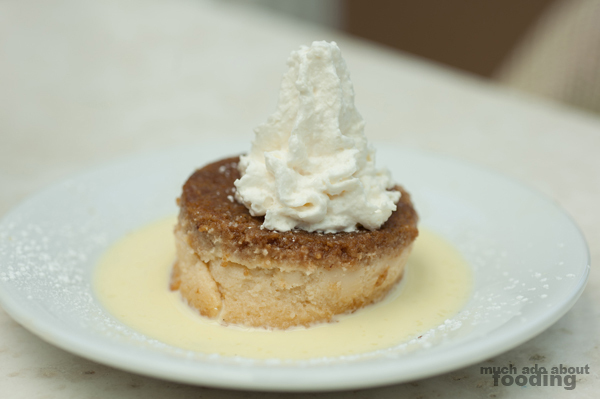 Though we had the sampler, we had to also get bites of their Caramel Mascarpone Cheesecake ($3.95 at 660 calories - Anglaise sauce and vanilla whipped cream) which ended up winning out over all of the dolchini. Light from the mascarpone as compared to other cheesecakes but still decadent in flavor, this dessert was sizable for its price point and more than enough for two people who just wanted to finish off a meal with a whiff of something sweet. It was also unique since it had the crust on top but that actually made it more appealing; the crumble stayed on the roof of your mouth with each spoonful so as to be a part of every taste. Overall, I can see this place doing well in its demographic at Irvine Spectrum. It falls somewhere between an Olive Garden and a Cucina Enoteca for the area and has fabulously positioned itself to be a great group gathering spot. 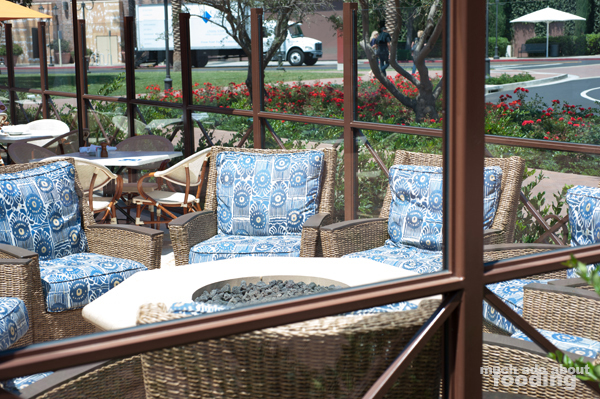 Find them at 618 Fortune Drive, Irvine, CA 92618 in a stand-alone lot. 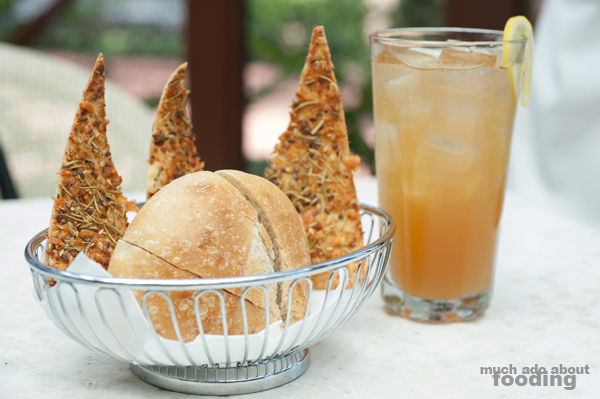 Our thanks go out to the team for having us AND for graciously offering TWO of our readers the opportunity to receive a $25 giftcard to BRIO Tuscan Grille just for being fans of Much Ado About Fooding. To enter, see the widget below and make sure to share with your friends! The giveaway will run until 9/1/14 at 11:59pm PST. Winners will be contacted upon winning and have 48 hours to respond before runner-up winners are drawn.